To appear in EUROGRAPHICS 2010. 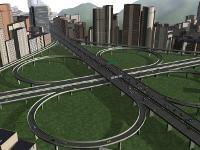 We present a novel method for the synthesis and animation of realistic traffic flows on large-scale road networks. Our technique is based on a continuum model of traffic flow we extend to correctly handle lane changes and merges, as well as traffic behaviors due to changes in speed limit. We demonstrate how our method can be applied to the animation of many vehicles in a large-scale traffic network at interactive rates and show that our method can simulate believable traffic flows on publicly-available, real-world road data. We furthermore demonstrate the scalability of this technique on many-core systems. This video summarizes our results and showcases animations of traffic flow generated by our method. To better understand the performance of our technique as compared to a microscopic, agent-based simulation method, we have timed simulations using our technique and a popular, state-of-the-art traffic simulator for a variety of scenarios. 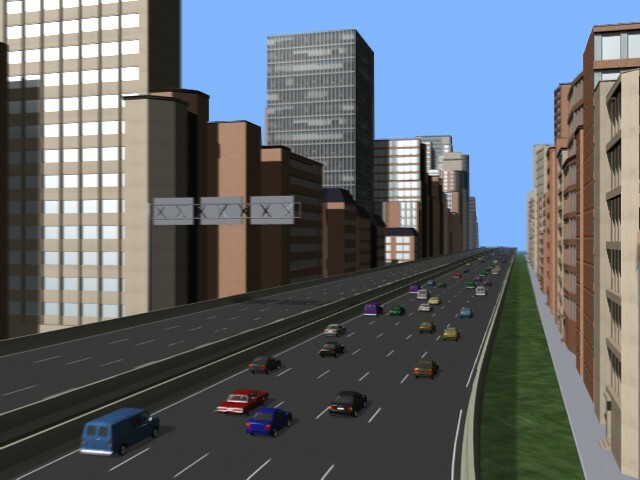 The Simulation of Urban MObility (SUMO) project is an open-source traffic simulation package originating from the Centre for Applied Informatics at the University of Cologne and the Institute of Transport Research at the German Aerospace Centre. 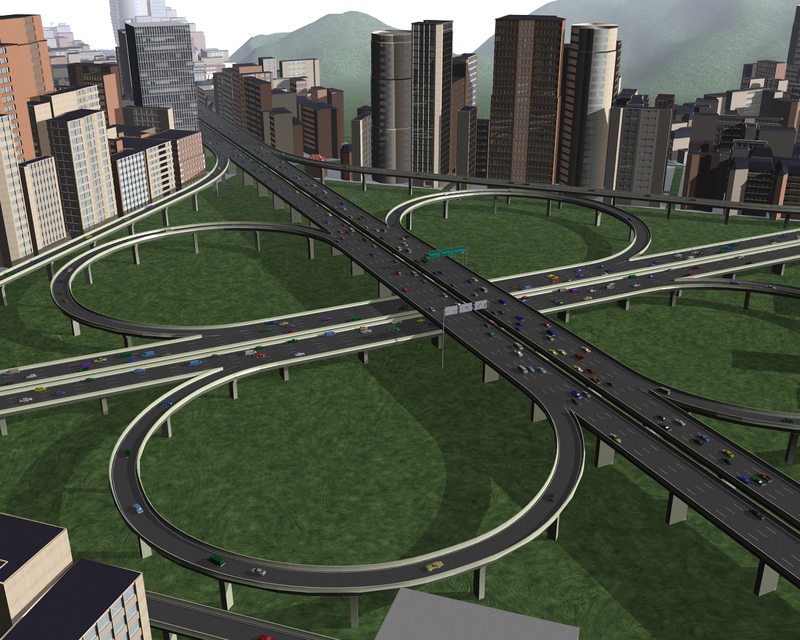 SUMO is based on a microscopic car-following model of traffic flow, and we would therefore expect its performance to be linear in the number of vehicles in the simulation. 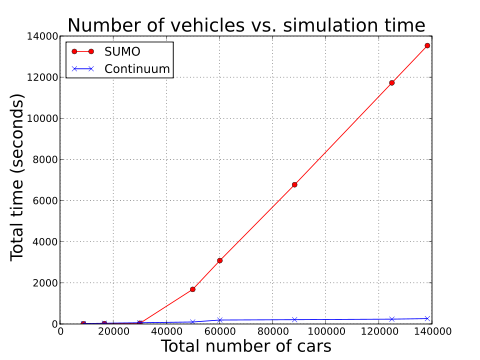 We observe nearly linear performance in the number of cars for SUMO in scenarios with a small number of cars, but a dramatic drop in performance as the number of cars increases. In contrast, our simulator maintains a nearly linear performance over all ranges of inputs, but has a larger constant overhead than SUMO for a small number of cars. 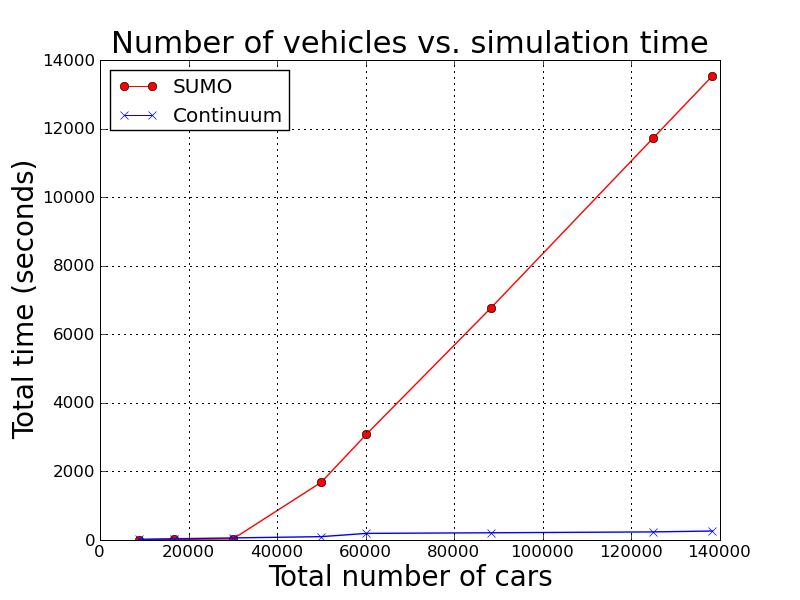 The qualitative results here are roughly what we would expect: SUMO should have some cost per vehicle being simulated, resulting in performance linear in the number of vehicles in the simulator, while our technique has a constant cost associated with the total network size, regardless of the number of vehicles, as well as a much smaller added cost per vehicle in the network.